I don’t need a calendar to know when it’s February! Since last week, my Mexican plum’s sent bees into euphoria and “scent” me out for perfume that’s bottled in my memory. But this February fascinates me (sort of). After brutal cold punches, we soar into the upper 80s. Very quickly the waiting game of “dead or dormant” was over. My fried firecracker ferns are unfurling fast. Ligularia popped right out, much to my surprise, since it’s the first freeze since I planted it in my shady bed. The next several weeks are the busiest for us as we tidy up and pop out those weeds so wisely hiding under browned foliage. Garden rehab is often a bigger event. We buy a house that comes with a weedy, overgrown yard. Or, we’ve let shrubs get out of control or we just need to update. 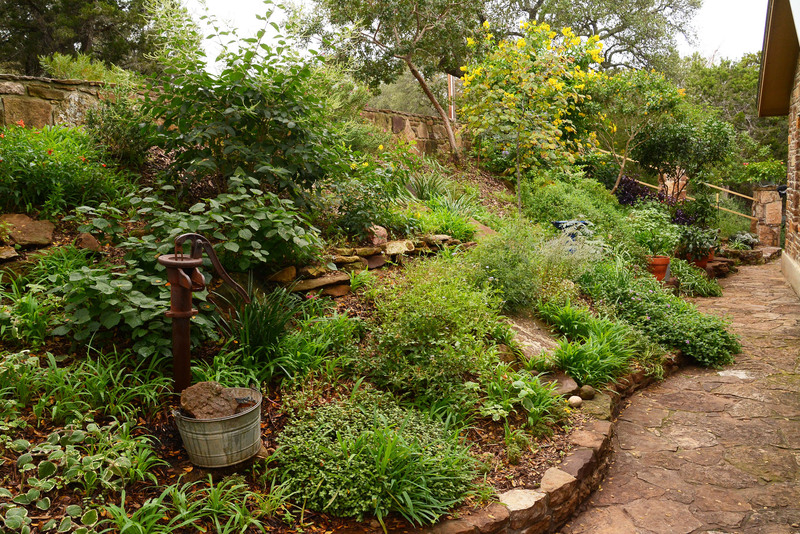 Designer Leah Churner from Delta Dawn Sustainable Gardens explains how to restore and renew. Leah tells us that sometimes we’ve gotta do some housekeeping after we analyze what’s good to keep. As in: yank stuff out! Overgrown shrubs? Sometimes you can cut them to the ground, like with abelia, primrose jasmine and spiraea. Usually, we want to only take about 1/3 at a time. Here, Leah restored an abelia crowding the porch by cutting back to about 3’. Watch now! Here’s an excellent pruning how-to guide by Texas A&M Agrilife’s Doug Welsh. Constantly I refer to the American Horticultural Society’s Pruning and Training manual. Even if the plant you have in mind isn’t listed, its concepts are covered. Excellent guidance for rehabilitating and overall pruning. In case you missed it, watch our small space gardening segment with Leah! BUT, patience is key right now, since many browned plants won’t show new growth just yet. Scrape the bark to see if it’s green, like I did on my native Barbados cherry. 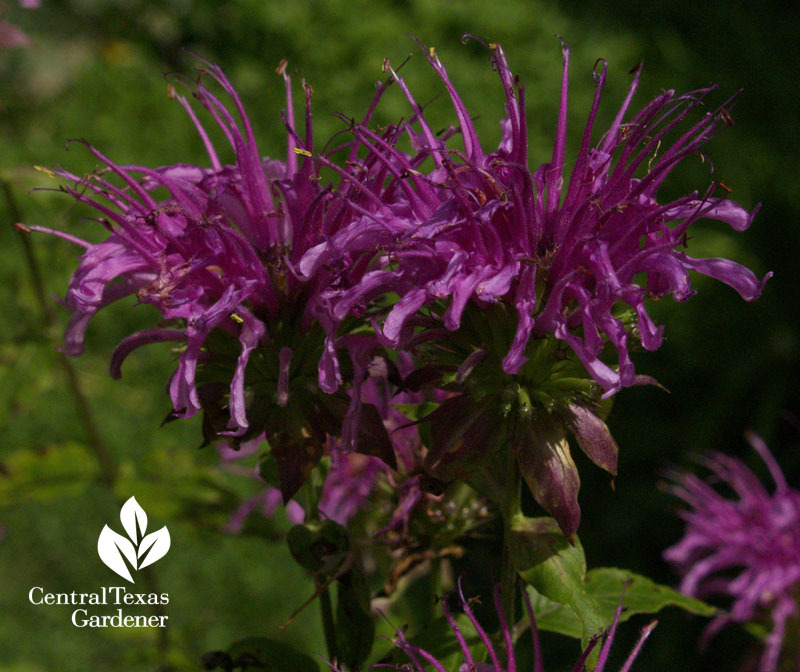 My Peter’s Purple bee balm (a Monarda hybrid) sent out an underground scout this week from its ever-expanding clump. By May, tall beacons of tubular flowers send food alerts to eager hummingbirds and bees. Deer “should” avoid. 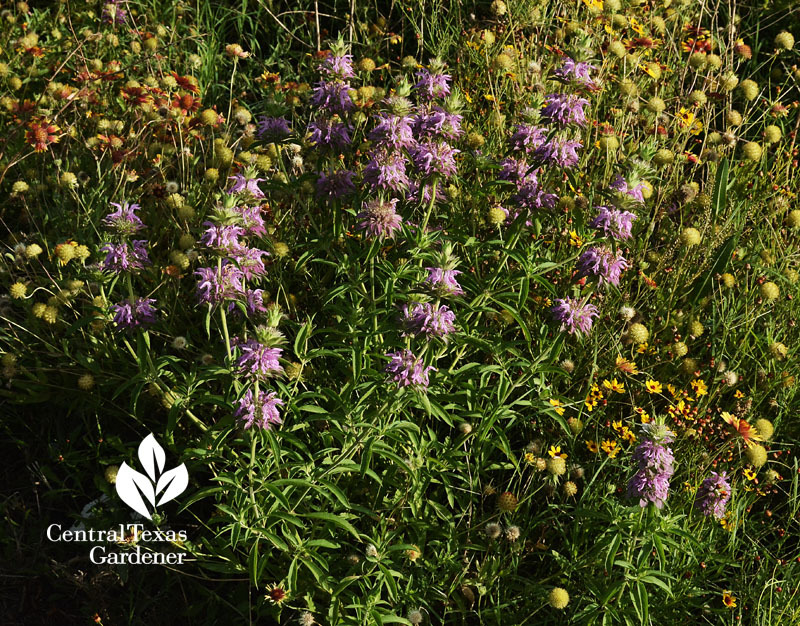 Monarda citriodora, often called purple horsemint, is an equally beloved native. But, as Daphne tells us, Peter’s Purple is resistant to powdery mildew. Grow it in full sun to part shade in clay to well-drained soils. Find out more. It won’t be long before we see blossoms on our citrus plants. Now’s a great time to fertilize with nitrogen. For six years, Chris Lalich has harvested lots of Meyer lemons from his trees. But every year, the lemons are covered with small black spots. They don’t affect the fruit’s quality. We checked with Monte Nesbitt, Texas A&M AgriLife Extension fruit specialist, who confirmed that the large scar is the result of a bird pecking, very common when birds are looking for moisture. The black, peppery spots are a fungal disease called Melanose. Daphne explains how to control it. Even houseplants need a little rehab now and then. John Dromgoole shows how to graft leggy plants to make new ones to pass along or add to your indoor collection. On tour, Syd Teague explains how she reshaped flooding, weedy land when she moved from Tucson to Austin. Although she wanted water thrifty gardens, first on her design drawing board was to manage storm water runoff from uphill. A series of rocky dry creek swales slow down and deflect rain bombs. Then she brought in good soil to build berms that help push water away from the house. As she shaped her land, it became her outdoor laboratory from succulents to flowering perennials. “Since I’m using the rocks for grass, it’s the space holder that most people would put grass in. Then I put an edge around it so that you can contain your eye if you don’t want to look at the rocks,” Syd tells us. Next up was to build walkways to travel safely around and through the garden. Shelf rock she’d originally bought for a pond that never happened was just the ticket. Laying only 20-30 feet per year, it took some time. As each new path evolved, so did her design. Along the way, Syd discovered the power of plant repetition. Syd dedicated one berm in back to the succulents she loves. She amended her clay soil with a well-draining, gritty cactus mix. Here’s back to the house on that path, where roses, perennials and small shrubby trees prompt a new view every month. Dodging rain spurts, Billy Driver popped the umbrella to protect the camera. Director Ed Fuentes loves rain as much as I do. The camera: not so much! In the far back, more shelf rock and little rock bridges over dry creek swales gravitate to shade gardens. Always experimenting, Syd finds new spots for plants that pop up in her garden. When a neighbor’s crape myrtles moved over, she gathered them into a row that lightly breaks up the view from the bedroom. A Christmas tabletop stone pine turned out to be an everlasting tree. In a courtyard patio protected by a shade sail, Syd grows a gallery of intricate cacti and other succulents. Now, she and husband Lary Evans watch the seasons and wildlife evolve with each turn of a calendar page. Syd’s a VP of the Austin Area Garden Council and board member of Zilker Botanical Garden Conservancy. We both invite you the 60th annual Zilker Garden Festival March 25 & 26! Watch now for Syd’s whole story!